Konvekta is frequently selected to supply dampers to many well known and prestigious projects. 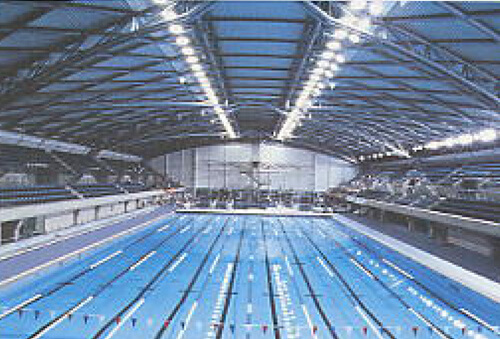 These include Ponds Forge Pool, Emirates Football Stadium and The Manchester Aquatic Centre. When it comes to making the right selection for a swimming pool damper application, many M&E Consultants, Specifiers and Contractors select Konvekta K500 PVC Corrosion Resistant dampers. Our materials and manufacturing technique make it an ideal and cost effective choice. This is due to the fact that the damper is suited to the conditions, unlike those of steel construction and will not corrode and is virtually maintenance free. The above reasons were taken in to consideration when we were selected to supply the dampers for Ponds Forge Pool at Sheffield. Installed within several areas of the pool hall some twenty years ago, these original K500 PVC Dampers still remain to this day in a fully functional condition, operating with minimal maintenance.